Starting the election silence period prior to the simultaneous general elections on 17 April 2019, Ministry of Communication and Informatics and the Election Supervisory Board (Bawaslu) have controlled the political campaign advertising content through digital platforms. Nevertheless, the ‘control’ will not limit the citizens’ rights of freedom of expression, said Director General of Information Applications of Ministry of Communication and Informatics Semuel A. Pangerapan. 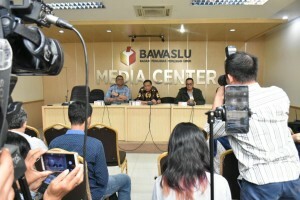 “Digital contents uploaded during the election silence period should not lead to political campaign, but that does not mean suppressing freedom of expression through social media,” Semuel said in a Press Conference on Handling Social Media during the Election Silence Period at Bawaslu Office, Jakarta, Saturday (13/4). The ban on placing advertisements in mass media as well as digital platforms on 14-16 April 2019 has been given by the Bawaslu. “The public can no longer posting political campaign contents in both the mass media and social media,” he said, adding that the Government will delete or suspend accounts that still promoting political campaign. Aside from social media, the measure to ban political campaign is done by removing banners and posters related to election participants/candidates. Semuel went on to say that all parties must support this silence period, including not using hashtag campaign or uploading political contents. In the meantime, during the election silence which started from 14 April 2019 on 12 p.m., the Bawaslu expressed hope that all social media platforms can also support the Government’s efforts by immediately following up on any findings of election campaign. “We also asked the social media platforms to reduce content or hashtags that contain track records or self-image of participants in the election,” said Fritz Edward Siregar, one of the Bawaslu members. All social media platforms must obey and follow the rules, while a circular letter regarding this matter will be sent to all social media platforms immediately.